We’ve built a strong reputation among businesses of the DFW area. 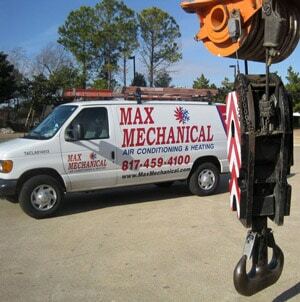 Max Mechanical, a commercial HVAC solutions contractor servicing the Dallas / Fort Worth Metro area, takes pride in our extensive commercial HVAC service offerings. Throughout the years we have been building a solid reputation among the DFW area business community and we feel those relationships continue to be our specialty. We have experience using cranes and helicopters to install roof units . We have the knowledge and expertise to service any brand or size HVAC unit. We perform annual maintenance on commercial HVAC units as well as complete system installs and repair. Our experience with rooftop units is among the best in the industry. 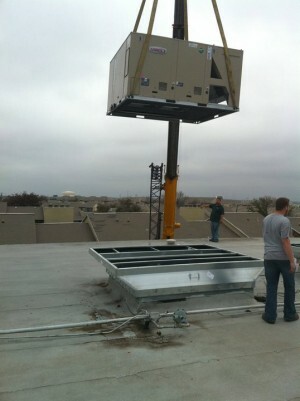 We even have experience using helicopters to install rooftop units. You will receive direct owner/operator involvement, personalized approach as well as professional and highly trained technicians whom we encourage to not only deliver reliably excellent service, but we also give them the flexibility to respond creatively to your requests and issues. We have commercial references available and are fully insured with general and workmans comp (which some companies don’t have) as well as being versed with the many DFW permit necessities and restrictions to make sure our commercial jobs go smooth. Call us at 817-459-4100 or 972-233-1637 or contact us online to request a free proposal or to schedule a service request. While our company is headquartered in Arlington, our service area extends across the entire Dallas-Fort Worth Metro area including Dallas, Fort Worth, Colleyville, Pantego, Mansfield, Keller, Hurst / Euless / Bedford, Southlake, Grapevine, Lewisville, and other surrounding communities.